Visit some of Canada's prairie habitats by taking our virtual tours. Pollination scientists will answer questions about the plants and insects that they've been studying in some of Canada's protected prairies. 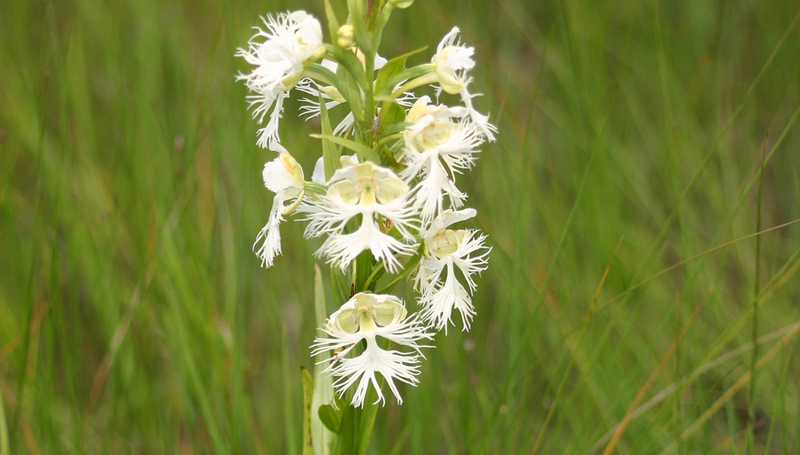 Visit the Tall Grass Prairie Preserve to find out how biologist Christie Borkowsky discovered who pollinated the rare and beautiful Western Prairie Fringed Orchid. View a transcript of the video "Mystery of the Western Prairie Fringed Orchid"
Take this behind-the-scenes tour of The Manitoba Museum's natural history vault with Dr. Diana Bizecki Robson to see how research specimens are stored. Dr. Anne Worley with the University of Manitoba talks about why the Small White Lady's-slipper is one of the prairies' sneakiest plants. Learn more about the intricate plant-pollinator interaction web that the rare Western Silvery Aster plant is part of from Dr. Diana Bizecki Robson. Dr. Art Davis with the University of Saskatchewan talks about how protecting wild pollinators and plants benefits humans. Manitoba Conservation biologist Chris Friesen talks about the unusual endangered moths and butterflies that live in prairie sand hills like those in Spruce Woods Provincial Park. Travel with Dr. Diana Bizecki Robson to Spruce Woods Provincial Park to find out how to save rare plants like the Hairy Prairie Clover.